The Datacube Explorer enables fast and easy visualization of (very) large MSI datasets, without the need for additional programming by the user. In the freely available Datacube Explorer manual, more information is available about the software registration process, the installation of the software, all functionalities, and the datacube file format syntax. 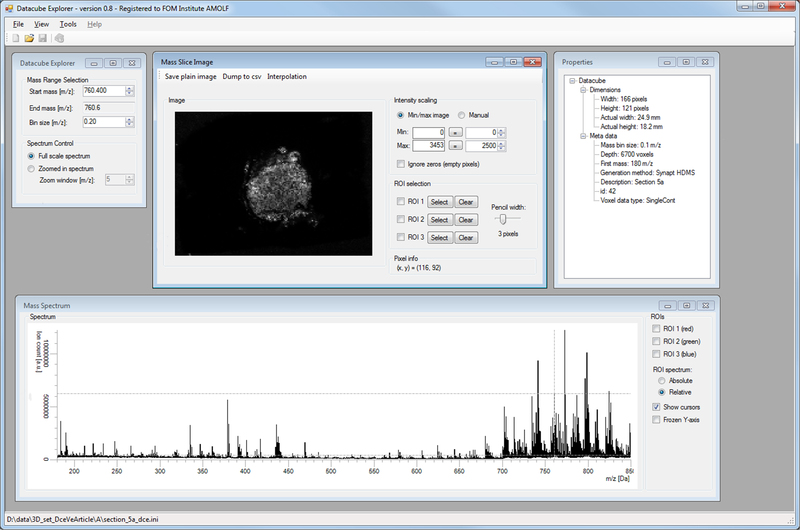 Loads imzML (both continuous and processed data), Biomap (Analyze 7.5), and AMOLF datacube (.ini/.dat) datasets. Both image and spectral view of the MSI dataset. Mass bin size flexible between 1.0 and 0.001 m/z. Loading of volumes-of-interests for large datasets. No software limitations on data size as from version 2.0 and up (although no Windows XP support anymore). Mosaic datacube structure available for extreme large datasets. Hierarchical presentation of imzML meta data. A specification of all features and how to use them can be found in the manual. The AMOLF datacube data format is a an open, fully specified data format which is relatively simple to implement for anyone with some basic programming skills. Permission to use this software for any non-commercial purpose without fee is hereby granted, provided that a personal licence key has been obtained from AMOLF. THE SOFTWARE IS PROVIDED “AS IS” AND AMOLF DISCLAIMS ALL WARRANTIES WITH REGARD TO THIS SOFTWARE. IN NO EVENT SHALL AMOLF BE LIABLE FOR ANY SPECIAL, DIRECT, INDIRECT, OR CONSEQUENTIAL DAMAGES OR ANY DAMAGES WHATSOEVER RESULTING FROM LOSS OF USE, DATA OR PROFITS, WHETHER IN AN ACTION OF CONTRACT, NEGLIGENCE OR OTHER TORTIOUS ACTION, ARISING OUT OF OR IN CONNECTION WITH THE USE OR PERFORMANCE OF THIS SOFTWARE. DISTRIBUTION OF THE SOFTWARE OUTSIDE OF YOUR OWN COMPANY OR INSTITUTE IS PROHIBITED. Download the manual (pdf file) for the Datacube Explorer (see above for the free license key). Download the latest installation file (.exe) for Datacube Explorer version 2.3 (May 2014 , no software limitations on data sizes). Download the installation file (.exe) for Datacube Explorer version 1.5.1 (last version for Windows XP). Example datacube datsets are a Grid Structure and a Fish Eye. Example imzML datasets are available from http://www.imzml.org. As from version 2.0 (where software limitations on the data size no longer exist) the Datacube Explorer requires Microsoft .NET version 4.5.1 (or higher) where Windows XP is no longer supported. However, the Datacube Explorer version 1.5.1 still runs on Windows XP and only requires Microsoft .NET version 4.0 to run. These .Net versions are freely available from Microsoft and you will be asked to install them by the installation program when they are missing. I. Klinkert, K. Chughtai, S.R. Ellis, and R.M.A. 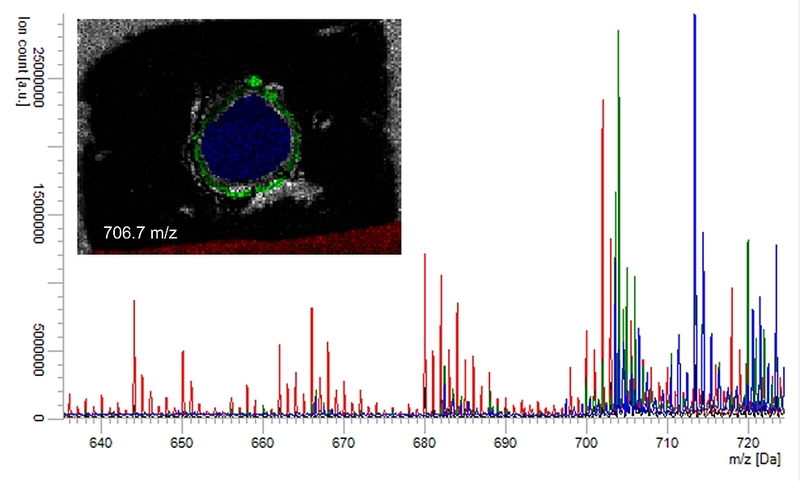 Heeren, Methods for full resolution data exploration and visualization for large 2D and 3D mass spectrometry imaging datasets, International Journal of Mass Spectrometry, 2014. 362: p. 40-47., http://dx.doi.org/10.1016/j.ijms.2013.12.012.